Apple today announced that its "Everyone Can Code" initiative is being expanded to more than 20 colleges and universities outside of the United States. RMIT in Australia, Mercantec in Denmark, Hogeschool van Arnhem en Nijmegen in the Netherlands, Unitec Institute of Technology in New Zealand, and Plymouth University in the UK are some of the schools that will teach Apple coding classes. 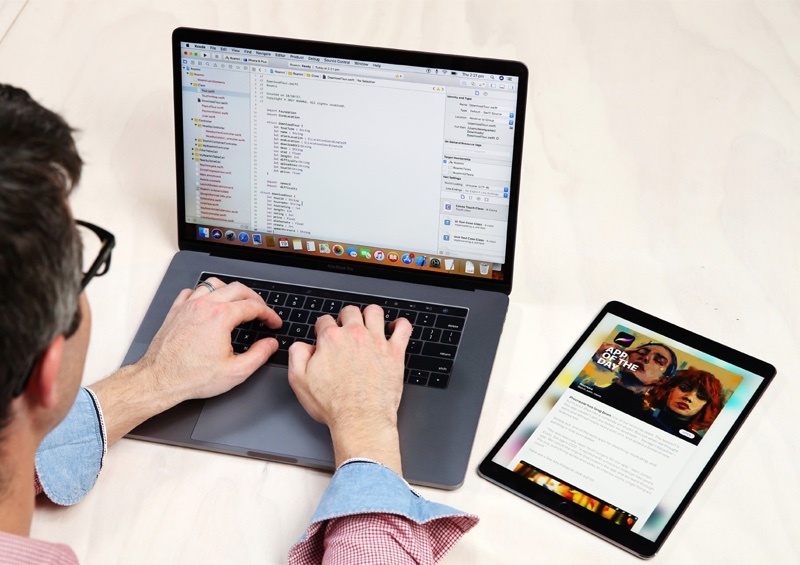 All participating schools will offer Apple's App Development with Swift Curriculum, which is a full-year coding course designed by Apple engineers and educators. The course aims to teach students how to code and design apps for the App Store, and it is open to students of all levels and backgrounds. According to Apple, RMIT University in Australia will offer one of the broadest implementations of the App Development with Swift Curriculum, making the course available through both a vocational course taught on campus and RMIT Online. RMIT also plans to offer scholarships to school teachers who want to learn to code and a free summer school course at the RMIT City campus. Apple introduced its App Development with Swift curriculum in early 2017, with the materials available as a free download from the iBooks Store. At the time the initiative was introduced, six community college systems serving 500,000 students across the United States agreed to offer the Apple-designed course. Later in the year, the course expanded to 30 more community college systems in the U.S. before becoming available internationally. App Development with Swift is offered as part of the Everyone Can Code initiative. Under the program, Apple also offers coding curriculum to students in elementary school, middle school, and high school. Apple: please learn how to develop apps so we can make 30% off of your hard work in perpetuity. While I agree, I think for tech companies their ulterior motive is to flood the job market with qualified personnel, allowing them to drive down wages and thus overall expenditures. It's been done before in many other disciplines. While it might be easy to jab at Apple for an alterior motive (i.e. learn how to code in thier language for future App Store inputs) one might want to consider the dismal academic performance of the average US student. I believe the average reading level in the US is still 3rd or 5th grade. Either way it’s abysmal. Current public curriculums seem to focus on a STEM outline. So to include coding, or other computer languages, into early learning is the best place for such an effort, and useful skills sets for the future. I learned to read music when I was six. The main instrument I learned on was the piano. But I can read for other instruments from having learned a basic music language. So if kids learn Swift to any point of proficiency, it will only help in their absorption of other programming platforms, not hinder it, nor make them slaves to writing Apple Apps. This sounds exactly like UK schools nowadays. Everyone is a winner, there are no losers, we are all as good as each other. Oh and look, a Pink unicorn with rainbows is over there also! Yes Tim, everyone can code "Badly"
That's like saying, everyone can spin a pot on a potters wheel. Yes, everyone will have a lump of clay that in some way might resemble a very ugly pot. A few will have a superb pot, but indeed, everyone CAN make a pot. Just Everyone can't make anything that's any good. Only some people can. But thats a long term goal, and just teaching people to code for Apple platform, no matter how big the market share, will be a bad strategy for you as the programmer/skill set person. Seriously, is Tim Cook ever doing anything else than these SJW/Globalization PR stunts? Take what’s positive and make it negative. Any learning is positive, and working as a software engineer or designer is both positive and dignified. I see only positive in all of this. Yeah, it's surprising how few American high schools have even the most basic computer science course. I'll bet they can easily at least find people to teach Python but just haven't gotten it through their management yet. They shouldn't have even waited until this new tech boom. It should've happened in the 90s. Oh Apple bring us a Swift version for Windows/Chromebooks that schools can afford. I am actually just about to graduate from RMIT with a degree in CS. Let me just say that I am 100% certain that this will produce 0 competent programmers, the quality of the professors at RMIT is quite low. Anybody who is of reasonable intelligence would be able to teach themselves how to program, and would be better programmers than the people who are supposedly teaching them how to code. For the forseeable future, programming will be largely a self-taught field. Anybody who is not capable of teaching themselves will not end up being a good programmer. I am expecting the quality of apps to go down even further.